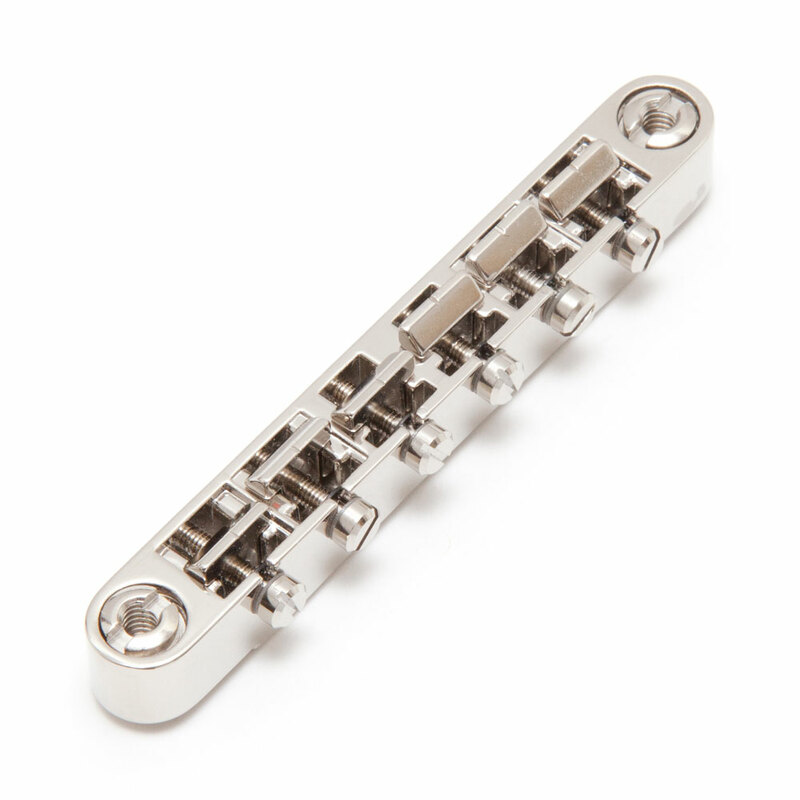 The Faber ABRL-59 Tone Lock Bridge is a vintage style 'no wire' ABR-1 bridge that locks directly to the bridge posts in the guitar body for improved sustain, vibration transfer and tone. The Tone Lock bridge slots on to the existing bridge posts and the height is adjusted using the thumbwheel as normal, when the height is set the locking sleeves thread on to the posts from above and clamp down on the top of the bridge, locking it to the thumbwheel and bridge posts, not only improving vibration transfer but eliminating rattles and any chance of the bridge falling off during string changes or the height adjustment accidentally being changed. To replace just the USA Nashville bridge posts use the Faber NSWKIT. To replace USA and Schaller Nashville body anchor studs use the Faber iNsert Kit. To replace just the metric Epiphone/Gotoh/etc style bridge posts use the Faber BSWKIT. To replace large Epiphone/Gotoh/etc style body anchor studs use the Faber E-Sert Kit. Please note the Faber Tone Lock Bridge does not come with any bridge posts included.